During the course of a year, the sun's intrinsic motion causes it to trace out a fixed circle which bisects the celestial sphere. This circle is known as the ecliptic. The sun travels around the ecliptic from west to east (i.e., in the opposite direction to the celestial sphere's diurnal rotation). 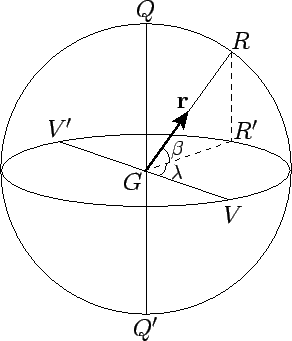 Moreover, the ecliptic circle is inclined at a fixed angle of to the celestial equator. This angle actually represents the fixed inclination of the earth's axis of rotation to the normal to its orbital plane. 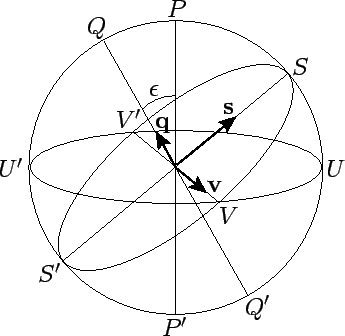 Figure 5: The ecliptic circle. , , , , , , , and denote the north celestial pole, south celestial pole, north ecliptic pole, south ecliptic pole, vernal equinox, autumnal equinox, summer solstice, and winter solstice, respectively. is the celestial equator, the ecliptic, and the celestial axis. Thus, , , and constitute another right-handed, mutually perpendicular, set of unit vectors. Figure 6: Ecliptic coordinates. is the earth, a celestial object, and its projection onto the ecliptic plane, .